I've known Matt and Laurie since around the time they got married in 1985. We've traveled the world together and supported each other in ministry for years. So I was excited to interview them about their new, much-needed program. "We started thinking about how, quite frankly, underserved the female audience is on Christian television," Matt tells me. 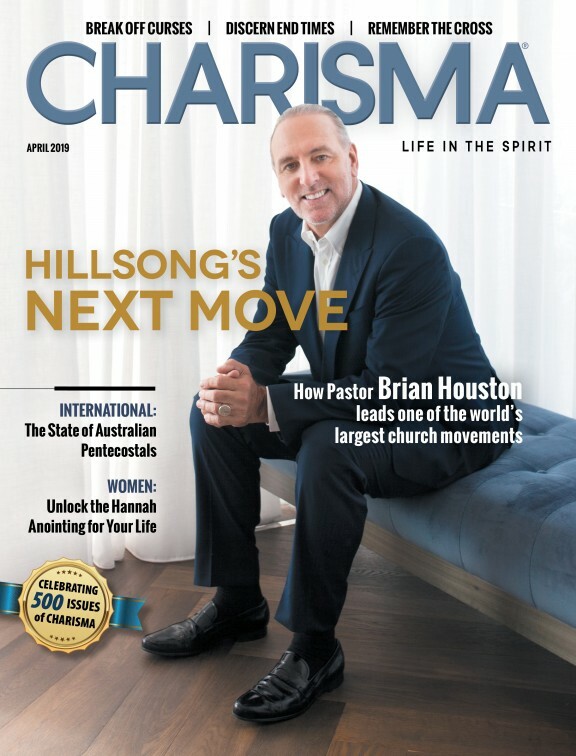 "We have dynamic people like Joyce Meyer, Beth Moore and others, but as far as having regular programming on our network, Trinity Broadcasting, we wanted to change that. So about a year ago, we started dealing with set people—decorators, producers, all sorts of different people it takes to make a TV program." Their goal is to create an atmosphere where women can have an authentic conversation about life and faith. Matt and Laurie have noticed throughout the years that whenever they attend a large dinner party, the women invariably congregate toward one end of the table and the men then go to the other end. Matt says that by the time the men sit down, the women are usually deep in conversation, fully engaged with each other. That's the dynamic the Crouches want for their new show. "We [want to] basically create an atmosphere where women could sit facing each other—in our case that's a circle—and they could have genuine dialog," Matt says. To do so, the Crouches hide small, high-quality, remote-controlled cameras around the set. They then roll the doors to the set closed so all the women are facing each other without the interruption of cameramen and cue cards. With women like Christine Caine, Victoria Osteen, Lisa Harper, Lisa Bevere, Holly Wagner, DeeDee Freeman, Jen Johnson and others, the conversation is always fruitful. "[The women] just sit there very naturally for a couple hours and talk," Matt says. "It's our post-production team that does a lot of work. They start breaking down this two-hour conversation into five programs that get deployed over a week." The Crouch's approach to Better Together is entirely different from most women's programs out there. Even The View—probably the most popular women's program in the secular arena—shows the women sitting at a table with cameras all around. But Matt and Laurie wanted to be careful to protect the feeling of natural and uplifting conversation. "[In contrast to The View,] this program deals with the heart," Laurie says. "Nobody needs another makeup tutorial. We need a soul tutorial. These are the issues of the heart that matters. I don't watch The View, but I've seen it a few times. But what I saw was very ugly. Iron sharpens iron, but our show is very encouraging. It's women staying together and sticking together. We all know God wants to do something for us ... but how do you make it through those times of difficulty, friendships, and identity and all that? That's what we deal with—finding your voice and your intimacy with God." Better Together tackles a variety topics, including friendships, toxic relationships, identity, social media, intimacy with God, children and family, and how to hear God's voice. Matt describes one moment on set he found particularly poignant. A few months ago, he was walking through the studio while they were filming for Better Together, and he overheard Lisa Bevere begin to minister on fear. In that intimate setting of just five women, Kari Jobe began to open up about her own struggles with fear. "Kari Jobe basically said, 'Oh my gosh, I can't believe that the Lord would have me here and this subject of fear would be brought up today,'" Matt recounts. "'I literally have had traumatizing episodes of fear.'" Matt then watched as Lisa Bevere and then Victoria Osteen began ministering to Kari Jobe—not only on fear but also on concerns she had with raising her children. "Kari was representing an entire generation of women who were being ministered to," Matt says. TBN continues to grow and produce incredible shows that build up the body of Christ. In that sense, the channel is constantly changing. But one thing that doesn't change is Christian women's need to support one another and build one another up in the Lord—and Better Together looks as though it will offer exactly that. Be sure to tune in to TBN's new women's show every day starting April 22 at 10:30 a.m. PT, and visit tbn.org for more information. Listen to my whole conversation with Matt and Laurie by clicking the podcast below!